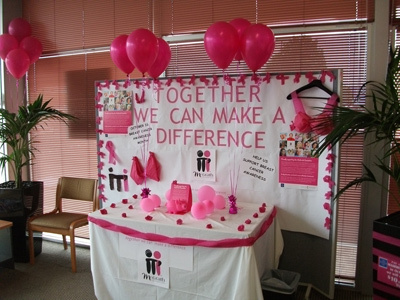 Perth Radiological Clinic gets in the Pink in October for Breast Cancer Awareness Month. October was National Breast Cancer Awareness Month and Perth Radiological Clinic took part in a national fundraising initiative partnering with the McGrath Foundation to raise money for more breast care nurses in local communities and to support more initiatives for breast cancer awareness, particularly in younger women. For every mammogram performed across Perth Radiological Clinic’s metropolitan network $10 was donated to the McGrath Foundation. 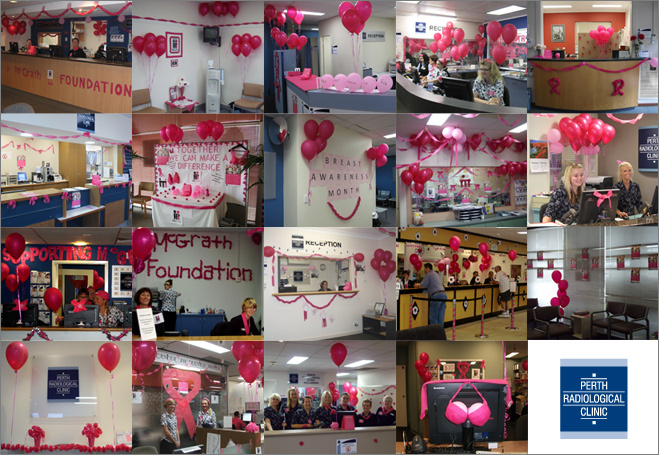 As part of the campaign all 19 of Perth Radiological Clinic’s suburban and hospital based branches were decorated in the McGrath Foundation pink and little pink pig money boxes were provided for patient donations to the Foundation. The Practice decided to run a competition amongst all its sites to see who could provide the best dressed clinic. Competition was fierce and our branch in Booragoon won the award. Congratulations to all the staff who really got involved in the campaign to raise money for, and awareness of, breast cancer, especially amongst younger women. Locally Perth Radiological Clinic raised a total of $14,031.10, and nationally the I-med diagnostic imaging network, of which Perth Radiological Clinic is a member, raised $109,537.17. Speaking on behalf of the McGrath Foundation Tracy Bevan, who was a close friend of Jane McGrath, said “the support is crucial to the ongoing work of the 55 McGrath Breast Care nurses nationwide”. “Among her many passions, Jane was incredibly committed to her belief that we needed to do everything we could to increase breast awareness across the community and particularly in younger women. She used to argue that no-one could know your body better than yourself and so we’re excited by our friendship with I-med as we see it as a very practical way women can take control of, and be responsible for, their own health. There is no doubt early detection can lead to better treatment outcomes and diagnostic screening is an important part of that process” Tracy said. Competition winner PRC’s branch at Booragoon. Perth Radiological Clinic would sincerely like to thank the following organisations who donated their time and their products to help support this initiative. We like to Party (www.weliketoparty.com.au) for providing our clinics with all their balloons and streamers at cost and also for delivering them to our sites free of charge. To BOCS Gas (www.boc.com.au) and Air Liquide (www.airliquide.com.au) for each providing enough helium for 1000 balloons free of charge.